A term reportedly coined by the poet Allen Ginsberg, “flower power” came to represent the nonviolence and peace movements of the 1960s. The classical context for the phrase was the placement of daisies into rifle muzzles, and the anti-war slogan “make love, not war.” Flower power is also representative of the general ambivalence to the use of military force that resulted from the American experience in Vietnam. It is hard for me to imagine when I would ever play this for the event. Conceivably, if I used Lone Gunman to spy on the US hand, and saw that they had literally a ton of “War” cards, then Flower Power would be worth it. Conceivably. Otherwise, the benefit is just way too speculative to pass up 4 Ops. As a 1 Op card, I might take the chance. As a 4 Ops, you’d have to be crazy, desperate, or most likely, both. Like NATO, this is one of those events you have to hope the opponent triggers for you. Like the USSR, you are probably not going to pass up the 4 Ops from this card. Unlike the USSR, you’re going to have deal with its ill effects later on: chances are, you’ll probably draw at least one or two “War” cards and be forced to space them or lose 2 VP per. Fairly annoying, and everyone has forgotten about Flower Power at one point or another and lost 2 VP without realizing it. Generally I’ll just space the War cards, which isn’t a big deal until you have other cards you want to space as well (or if you’re Purged). Brush War is of course the main exception. Usually I don’t end up playing An Evil Empire for the event unless I also have a lot of “War” cards in hand with An Evil Empire. And it goes without saying that if you draw Flower Power with “War” cards in hand, you should play all the Wars first. Note that Arab-Israeli War, if prevented by Camp David Accords, does not count for Flower Power and is a safe play. This entry was posted in Mid War, USSR Events and tagged flower power. Bookmark the permalink. >Note that Arab-Israeli War, if prevented by Camp David Accords, does not count for Flower Power and is a safe play. But, beyond this, I always said that this is probably the most flawed card in the game … even NATO make sometime sense to be used as event by US player ( I did this recently in a Vassal game when I had also Special Relationship in my hand too ) but its almost impossible to figure out a scenario when USSR will use this as event instead of 4 OPs ! I think the Arab-Israeli War case is explicitly discussed in the FAQ. I don’t think it is (at least not the Deluxe FAQ 5.1). I agree with Ioan76_TM in that it should still trigger the 2 VPs. After Camp David, Arab-Israeli War is still played for Ops, even if the Event cannot be triggered. The Space Race play is safe only because the card explicitly says so, not because the Event is not triggered. I’ve always kind of liked this card. The US is almost always going to play it for the Ops, as opposed to Spacing it, so it becomes a seductive trap. More than once I’ve seen somebody forget that it’s in play (including myself), and more than once have I found it difficult to manage it as the US when it’s in play because there are almost ALWAYS more important cards to Space than a stupid war card. And it’s always laughable to the USSR when the US plays Brush War under Flower Power (because why wouldn’t he?). Huh…I’ll be damned. I still contend that it doesn’t make sense, but it’s straight from the mouth of The Man, himself. I would disagree – I’ve had an opponent rinse me for 6 VP from this event. That’s equivalent to two or three Central America dominations! I’m not saying I’d usually use the event as USSR, but, it can be worth a few VP, and can put pressure on the US to space instead of ops. As always in TS, every card has its situation. its almost impossible to figure out a scenario when USSR will use this as event instead of 4 OPs ! I agree that this event can be really effective, but the USSR player can’t count on it. Those 6 VPs to which you refer were over the course of a few turns, I’m sure. If I HL Lone Gunman and see at least two war cards in the US player’s hand, then hell yes I’m going to play Flower Power for the event. But if I don’t know if the US is ever going to get a war card through the remainder of the game, or perhaps only gets one or two, and can Space them, then I’m playing Flower Power for Ops. However, as I mention above, I DO like this card, but I always hope that the US player triggers it. 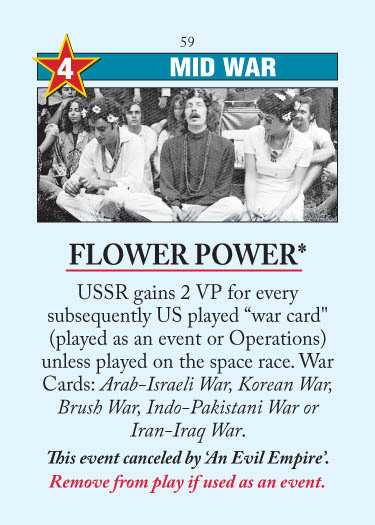 Bottom line: yes, it is definitely possible to figure out a scenario when the USSR will play Flower Power for the event (so yes, every card has its situation). So while I’m not necessarily disagreeing, I will say that sacrificing a 4 Ops AR for speculation is simply not worth it. There are situations later in the game when it’s impossible to spend the cards on the space race due to being so far ahead on it. I’ve been forced to spend 3 cards on ops due to this once and thus given my opponent 6VP. I’m of the opinion that the US should be more willing to space this card if they draw it on turn 4-5. Unless the US needs to do something, and only a 4 op card will do the job, I would space this on those turns. Should the 2 VP penalty be applied BEFORE the VP award associated with victory in the war (assuming the war card is played as the event), or AFTER, or SIMULTANEOUSLY? “Q. When exactly does the USSR gain victory points based on this card? I’m tempted to say that the War card effects are resolved first, because Flower Power does not use the word “immediately” when talking about the 2VP penalty, and there are no situations in TS that implement simultaneous scoring. But there may be a ruling of which I am unaware. I would say that since you play the card before you roll the dice, the 2 VP penalty occurs first. You only think that because you are an Edward fan. Kidding aside (I saw the Spam, too), I respectfully disagree simply because Flower Power does not use the word “immediately” or provide any other indication of scoring points preemptively or as an interruption of the card effects to score points (“We Will Bury You” being a notable and (I think) only example). But I see your point. Your argument is based on the question of what the game definition of “playing” a card is. Is a card “played” when it is laid on the table? Or is a card “played” when its effects are fully resolved? Does anybody else have any thoughts on that? I checked the link to Consimworld (provided by Theory above) to see if Jason Matthews addressed this specific question, and he does not. Similar issues also arise with Cuban Missile Crisis. For instance, let’s say the US has played Cuban Missile Crisis. DEFCON is at 2, and the USSR’s only influence is 2 in Cuba. USSR plays CIA created, the US announces they are couping Cuba, and then the USSR removes their two influence from Cuba to cancel the event. What happens now? Does the coup of Cuba occur? Cuban Missile Crisis states that the Soviet player may cancel the event at any time by removing 2 influence from Cuba, so I would say no, the coup of Cuba does not occur. ‘Any time’ indicates to me that you can remove the influence after the US announces that they’re launching a coup in Cuba. The US player would then have to pick something else to do with their ops.